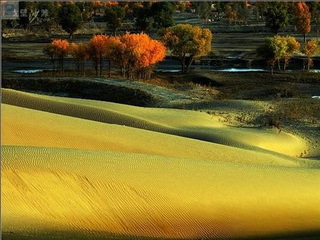 Huyang (Populous diversifolia) in China's Far West“The region of Xinjiang (“New Frontier”), China’s Far West, contains the majority of the planet’s forests of huyang (Populous diversifolia): 360,000 hectares, or more than two-thirds. This tree is a miracle of nature, able to withstand the worst ecological conditions. It tolerates salt, which it gives off through its bark. It tolerates drought, with its roots that seek water almost 20 meters down; but it tolerates as well several months’ flooding during the Tarim’s high-water season in the summer months, for this interior river- which is as powerful as the Danube but peters out in the Lob Nor sands – has a current fed by the Karakorum, Pamir, and Trianshan snow and ice melt in summer. This combination of high water and heat, which favours vegetation, has turned the banks of the Tarim into a corridor of life that stretches more than 2000 km across the desert. In its natural state the area is characterized by the primal huyang forest. Among the tree’s extraordinary properties there is also the appearance of its foliage with its changing forms, which has given it its scientific name Populus diversifolia: a single tree can have on it leaves so different – some as wide as an aspen’s, others narrower than a willow’s – that at first you would think you were looking at two trees. Last but not least, the profile of the huyang, with its massive trunk, which is said to take a thousand years to grow, a thousand to die, and yet another thousand to decompose once it has fallen, stamps its characteristic mark on the land both when it is alive – for example those incredible watery landscapes on the Tarim’s middle reaches, recalling Louisiana bayous in the middle of the desert – and when it is dead and its tortured forms, like an army of skeletons, rise up among the dunes or yardangs, where the shifting riverbed has given rise to desert. 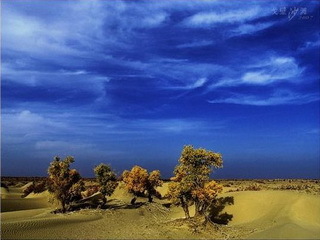 Hence, its amazing ability to stabilize sand, which has given it the nickname yingxiong shu,”the defender tree”: it protects oases against the Taklamakan. How well Berque draws our attention to at once the magnificence of nature’s offerings and the importance of human understanding of those offerings and the need to protect and preserve! 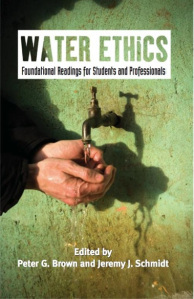 The book is presented in six parts, the first of which asks what we ought to do and begins to clarify what it means to be in a water crisis. It is followed by parts on “dominion and the Human Claim to Water, Utilitarianism, Water as a community Resource, Water: Life’s Common Wealth, and Ethics in Complex Systems. 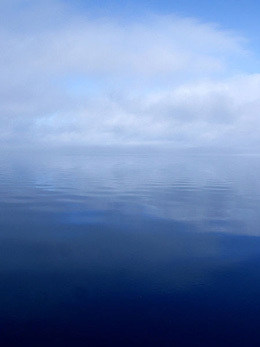 Water in three states: liquid, solid (ice), and (invisible) water vapor in the air. : Clouds are accumulations of water droplets, condensed from vapor-saturated air. 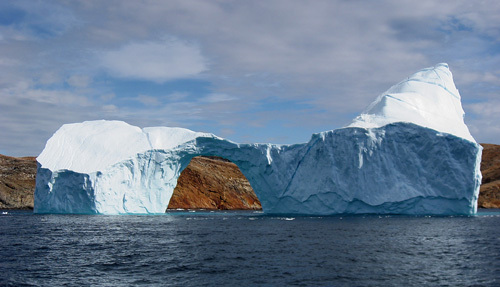 Iceberg between Langø and Sanderson Hope, south of Upernavik, Greenland. Photograph by Kim Hansen courtesy of Wikipedia. The Editors astutely introduce each section of the parts of the book which were written by authors who draw upon their diverse backgrounds in law, water management, agricultural and environmental sciences, water policy, international relations, economics and studies of religion and ecology. This book provides a firm basis on which to expand the dialogue about “Water Ethics,” and provides good ideas on which to build. The questions of the problems of water and health are not addressed in the detail I believe they need to be, nonetheless, it is an excellent resource and a good beginning. Fog on the St. John's River, Florida: taken at the Shands Bridge on the Duval/St. Johns County side, 9 am. Photograph by Moni3 courtesy of Wikipedia.Jeremy Schmidt responded for this review to questions from Janine Selendy, Chairman, President and Publisher of Horizon International, who wrote the review. Q. How is a water ethic distinct from what we usually call environmental ethics? How does that matter in practical terms? A. This is a good question. The difference is that the field of environmental ethics arose primarily as an attempt to extend moral consideration from humans to non-human animals and, often, to the natural world itself. In this sense, environmental ethics focused on a set of philosophical problems regarding the nature of moral value. By contrast, water ethics begin with the practical governance systems through which water is managed, such as the irrigation works of small-scale farmers in Peru, and the value systems that are already used to legitimize rights or other types of cultural claims to water. As our book suggests, all approaches to water management are inherently ethical because the distribution of water affects individual lives and social livelihoods. The distinction between environmental ethics and water ethics does not mean that the two are exclusive. As we also try to show in the book, at least part of addressing water management challenges requires identifying ways that moral considerations are not extended appropriately, such as in the denial of rights to women or the poor. So the contribution of the book is really two-fold. First, to show that water ethics must be addressed to the practical values that affect how water is managed and governed. Second, that the search for new values requires considering how water ethics fit with broader moral considerations and the types of values that underlie other spheres, such as those of rights. Q. How do water ethics help us to understand concepts usually thought of as good in themselves, such as increasing water efficiency? A. Concepts like efficiency and productivity are the buzzwords of water policy. But they are not value neutral and neither do they make sound decision-making rationale on their own. This is for two reasons, both of which are aided by understanding and examining the practical water ethics of particular places. First, efficiency is a calculation of two things that are put into a ratio with each other. For instance, we can aim to get ‘more crop per drop’ by seeking to modify the ratio between agricultural yield and water consumption. But when we calculate efficiency how do we know what two things to put into ratio, or which should go in the numerator and which in the denominator? For this we rely on ethics and the practical judgments we make regarding other ends that we consider good. For instance, decreasing agricultural water use may be desirable because of some other good, such as keeping water in rivers or because we need water for cities. Second, our judgments regarding what to compare in calculations of efficiency or productivity depend on many other factors, such as the kind of water governance system we have in place and the types of rights that others have to water. So these sorts of policy metrics need to be contextualized and examined for how they value certain goods amongst all of the others that water also supports. Q. How can water ethics help us develop culturally appropriate solutions to water challenges? A. One of the great challenges of water management is that there is not a ‘one-size fits all’ solution. By considering the water ethics of different places, we can begin to see that different cultural and ethical norms are often layered on top of each other in complex ways. The Sante Fe River in New Mexico, for instance, is one of the most threatened in the United States. And the governance systems and legal rights that affect different users of the Sante Fe, from indigenous people to urban municipalities, reflect a complex history of different water uses and different ways of managing water. Attention to water ethics in such cases can help to show that all approaches to managing water are inherently ethical – each involves value judgments regarding how water fits with broader cultural and social understandings of the world. Once we look at things in this light, it becomes more evident that broad policy prescriptions are likely to be ineffective in producing the actual, necessary improvements to water management whenever they are not attentive to the cultural norms and values already at work in a particular place. In our book, Peter Brown and I do not try to resolve all of these issues, but we do argue in our concluding chapter that we need to examine the values supporting the types of management that are often promoted as primarily technical or scientific exercises. Our suggestion is that it is not wise to value water according to only technical or scientific criteria this because these methods have traditionally tended to promote one, or only a small set of metrics, when in fact water is critical to supporting the entire complex of life upon which we all depend. In this sense, we suggest that we will need to think about water ecologically—as something that binds us together in a shared and interdependent world—and which we must all steward together. In this regard, we argue for that the practical wisdom accrued through centuries of different cultural approaches to water management should form the basis for ecologically sound water sharing practices. The Web site for “Water Ethics” is www.waterethic.ca. Peter G. Brown's teaching, research, and service are concerned with ethics, governance, and the protection of the environment. His appointments at McGill University are in the School of Environment, the Department of Geography, and the Department of Natural Resource Sciences. He is the co-author of Right relationships: Building a Whole Earth Economy and of The Commonwealth of Life: Economics for a Flourishing Earth. Jeremy J. Schmidt is a Social Sciences and Humanities Research Council of Canada (SSHRC) post-doctoral fellow in Social Anthropology at Harvard University. His research focuses on ethics and water governance. In 2009 he was awarded a Trudeau Scholarship, Canada's highest doctoral award in the Social Sciences and Humanities. His work appears or is forthcoming in journals such as: Ecology and Society, Society and Natural Resources and, Environmental Values. This book review is presented as part of the Supplementary Material to accompany the book, “Water and Sanitation Related Diseases and the Environment: Challenges, Interventions, and Preventive Measures,” a Wiley-Blackwell collaboration with Horizon International.